My little boys love vehicles of all sorts and VTech hasn't left them out this year with the Go! Go! Smart Wheels Train Set. With sounds, music and vehicles it is hours of fun for little guys and even my big boys have spent a lot of time enjoying this toy! I love that it has Smartpoint Technology! As your child moves their vehicle along the track there are spots that are activated and play songs or make noises to encourage more play and makes the whole track a ton of fun to explore! The Smartpoint technology even recognizes the different vehicles and makes different sounds for each! My boys love to use the hand crank to help the motorized train up the hill and then watch it slide down the spiral track!! 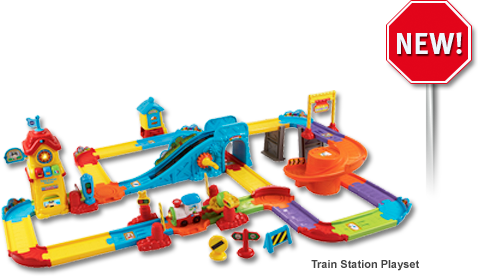 It includes 32 pieces of track which makes 15 feet of play space, a motorized Train Engine and 1 car.